As you likely remember, Google releases its list of the most searched items, people and events each year. This year it has been re-named “A Year in Search: the moments that defined 2014,” and offers a wide range of stats on a number on the most popular search terms of 2014. 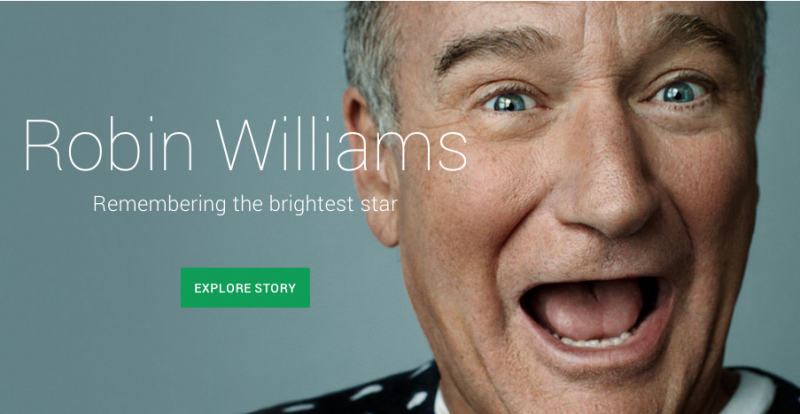 Some of the most popular search queries included the World Cup, Ebola, MH370, ALS, Flappy Bird, Conchita Wurst, ISIS, Frozen and Sochi, but it was the late actor/comedian Robin Williams that took top spot. Google has produced a slick new A Year in Search site highlighting many of the most talked about topics, news stories and individuals of the year. You’ll find everything from “the rise of the selfie,” to details on the topics mentioned above, and more. Last year we saw tech devices represented in the top 10, but this year Google has parsed out electronics gadgets into more specific tech categories. Apple’s latest smartphone followed by the Galaxy S5 and the Nexus 6 topped the trending consumer electronics list. As a little bonus, Google said it’s adding a quick update to search allowing users to find 2014’s most trending stories and discussions. Searching for [google 2014] will bring back a quick peek the top searches for 2014, however this feature does not appear to have rolled out everywhere just yet.